iPod Touch 4G coming with 3.5-inch Display with 960 x 640 pixel resolution, while camera and video features include VGA-quality photos and videos of up to 30 fps and HD video recording (720p). Wireless specs are 802.11 b/g/n wireless technology for WiFi, and Bluetooth 2.1. There’s also a 3-axis gyro. + iOS 4.1 with Gamecenter. So if you get an iPod Touch 4G, if you have lots of MTS/M2TS videos downloaded from Panasonic/Sony/Caon/JVC camcorders or extracted from Blu-ray discs stored on PC, you will be lucky to enjoy movies up to HD 720p on iPod Touch 4G everywhere. All what you need is a wonderful and helpful MTS/M2TS to iPod Touch Converter. And now Aunsoft MTS/M2TS to iPod Touch Converter is in such a leading way to help you. How to convert MTS/M2TS files to New iPod Touch 4g? Step 1. Load MTS/M2TS to Aunsoft MTS/M2TS to iPod Touch 4g Converter. Download MTS/M2TS to iPod Touch 4g Converter, and click the Add button to load .mts, or .m2ts files. 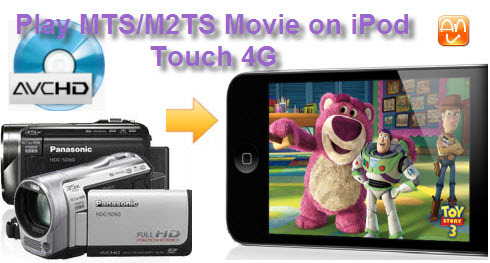 No matter you get the MTS/M2TS files from your camera, or from your friend who made a copy of blu-ray disc, the MTS/M2TS to iPod Touch 4g Converter will load the .mts, .m2ts videos for conversion to the latest iPod Touch 4g. Step 2. Choose iPod Touch MP4 output. Click the "Format" option and choose iPod > iPod Touch 2 H.264 (*.mp4) or iPod Touch 2 H.264 (*.mov) as output format for iPod Touch 4G. (If you want to get 720p HD MP4 format, please click “Settings” to customize the Size to 1280*720 by yourself). Tip: The default resolution of output format H.264 MP4 is 480*320, if you don't like it, please click "Settings" to set the size (pixel) to 800*480 or 854*480, or you can custom the resolution if you wish to. Step 3. Convert MTS/M2TS to iPod Touch 4g. Click the convert button under the preview window and the conversion from .mts or .m2ts to h.264 mp4 for iPod Touch 4g starts right away. Wait for a while, you can easily get your iPod Touch 4g H.264 MP4 videos in destination folder. Then you can transfer your videos to iPod Touch 4g for playing by using iTunes. As most Blu-ray discs are encrypted with region code or copy protection like AACS or BD+, you shall decrypt Blu-ray disc before loading to the MTS/M2TS to iPod Touch 4g Converter. Home-made Blu-ray disc generally does not include copy protection. You can remove copy protection from Blu-ray disc with Aunsoft Blu-ray Ripper. If you have both Blu-ray discs for conversion to iPod Touch 4g, and MTS/M2TS files from camera to iPod Touch 4g, you can use Aunsoft Blu-ray Video Converter Ultimate.